Situated on a bluff that overlooks Morro Rock and the Embarcadero, Blue Sail Inn offers incomparable views, along with a premier location near all the top local attractions. Just a short walk from Morro Bay, Centennial Park and Morro Rock Natural Preserve, our hotel puts you within quick reach of kayaking, biking, beachcombing, sightseeing, golfing and wineries, along with local shopping and dining venues. 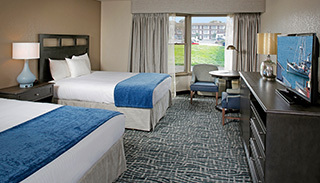 Within our spacious rooms, you'll find thoughtful amenities, including free Wi-Fi, microwaves and cable TV with HBO. We also provide courteous, attentive service to ensure that your stay is relaxing and comfortable. 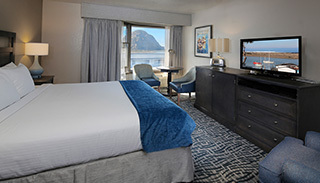 Whether you're in search of an outdoor adventure, a dining experience or a peaceful night of rest, our Morro Bay hotel is the perfect place to enjoy one of California's most alluring travel destinations. TOP REASONS TO STAY with us! 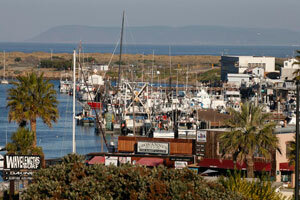 In search of superior lodging in Morro Bay, CA? Come relax at Blue Sail Inn and enjoy spacious rooms with stunning views of the most dramatic and beautiful scenery California has to offer. Outfitted with modern amenities, including refrigerators, microwaves, free Wi-Fi and cable TV with HBO, our rooms offer panoramic balcony views of the Bay and the Embarcadero. 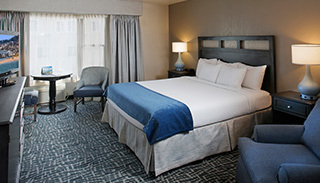 Select rooms also come with wet bars and fireplaces for an especially relaxing atmosphere in this alluring destination. This well-appointed room features two queen beds in our East building. 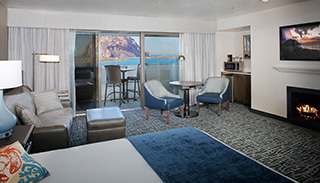 Enjoy beautiful views of the Bay and Morro Rock from a bay window in our East building featuring a king bed. This well-appointed room features a king bed in our East building. 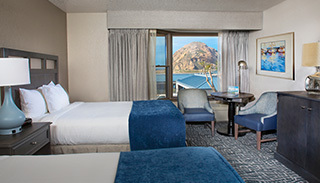 Enjoy beautiful views of the Bay and Morro Rock from a bay window in our East building featuring a two queen beds. Perched on a bluff overlooking Morro Rock and the Embarcadero, Blue Sail Inn provides an ideal location that puts you within quick reach of shopping, dining and the area's breathtaking natural attractions.